The Ecotex 3pc Packing Cube Set™ is made from 10 recycled water bottles. By utilizing discarded materials to create new products, Heys offers an Eco-friendly choice for a clean and sustainable future. What is Ecotex ? 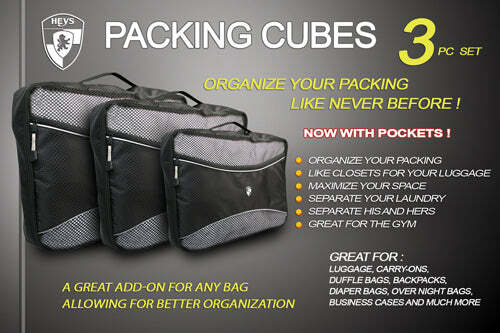 The Ecotex 3 piece Packing Cube Set™ allows you to organize your packing while saving space at the same time. You can pack your larger items in your Large size packing cube, your other items in your Medium size, and your smaller accessories in your Small size packing cube. Avoid unhygienic Hotel drawers and dressers by keeping your clothes in your Packing Cubes when you unpack. Use the Cubes to pack your laundry to keep separate from your good clothes. His / Hers in separate bags, packing for kids, undergarments and accessories the possibilities are endless for organized packing. Never open up a suitcase to have things spill out in a mess, the packing cubes allow for compact, organized packing, as well as organized unpacking. Made form durable but lightweight Ecotex material. 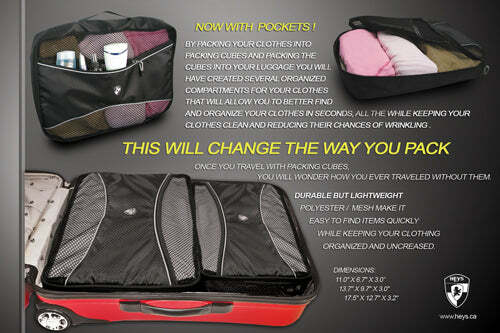 The Packing cubes have zippered front pockets for quick and easy access which also help to better organize. Comes with carry handle, and corded double zipper pullers which makes for easy opening and closing. Can be used with Luggage, Carry-ons, Duffle Bags, Backpacks, Overnight Bags, Business Cases and much more. This product is also available in Eco 5pc Packing Cube Set, Exotic 3pc Packing Cubes and Pack ID Packing Cubes. 3 piece set in Large / Medium / Small sizes.